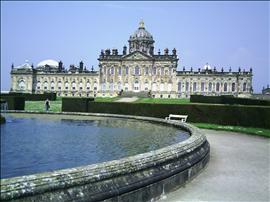 Castle Howard is one of England's finest historic houses, set in a thousand acres of sweeping parkland dotted with statues, temples, lakes and fountains. Inside discover world-renowned collections gathered by succeeding generations of the Howard family. Built over 300 years ago, today it still remains a family home. The venue is situated outside the centre of the city. This venue is situated in York. The venue is situated on a road which has a steep gradient. The nearest mainline station is Malton. There is a Coastliner bus service that runs for part of the year from York station. For more information call 01653 692556 or visit www.yorkshirecoastliner.co.uk. There are 11 designated parking bay(s) within the car park. The dimensions of the designated parking bay(s) are 220cm x 350cm (7ft 3in x 11ft 6in). The nearest designated bay is 13m (14yd) from the main accessible entrance. The car park surface is concrete. The designated bays are on concrete, but parts of the car park have loose chippings or grass surface. You are on Outside Access (Grounds Entrance). Skip to the next section. The main doors open away from you (push). The doors open towards you (pull). The door opening is 137cm (4ft 6in) wide. You are on Level Change (Grounds Entrance). Skip to the next section. The width of the ramp or slope is 250cm (8ft 2in). The doors are normally held open when the venue is open. You are on Outside Access (House Entrance). Skip to the next section. The door opening is 120cm (3ft 11in) wide. You are on Level Change (House Entrance). Skip to the next section. This is the entrance to the Gift Shop, but it is also the accessible entrance to the house. A member of the Gift Shop staff needs to unlock the door for you. You are on Reception (Ticket Office). Skip to the next section. The reception desk is 25m (27yd) from the front entrance. There is not level access to reception from the entrance. The reception desk is high height. There are automatic doors leading from the Ticket Office into the grounds and back into the courtyard. The courtyard between the main entrance and the ticket office has an uneven paved and cobbled surface and an easy slope. The details here are for the main house itself. At the end of the tour, the chapel can only be accessed via a spiral staircase. Patrons who cannot manage these stairs are directed through a door back to the stair lift. There are plenty of seats available throughout the tour. A guide will provide one if there isn't one available. Most of the grounds are accessible via tarmac paths of easy or moderate gradients. Some paths are steep and have grass and gravel surfaces. There is a 'Kelly Car' which gives free transport from the Ticket Office to the House and the Lakeside Café & Adventure Playground. There are ramps available to give wheelchairs access to the Kelly Car (see photo). The floors which are accessible by stairs are G - 1. The lift is located leading from accessible entrance to main house. The lift is a stair lift. The floors which are accessible by this lift are G - 1. The lift is 25m (27yd) from accessible entrance. The dimensions of the lift are 70cm x 85cm (2ft 4in x 2ft 9in). You are on Restaurant Bar Internal (Courtyard Cafe). Skip to the next section. Once inside, there is not level access to the service. The distance between the floor and the lowest table is 69cm (2ft 3in). The type of food served here is lunches and snacks. There are automatic doors at the entrance to the café, 100 cm wide. There is outdoor seating available, accessible via a 170cm wide moderate ramp with handrails on both sides. You are on Level Change (Courtyard Cafe). Skip to the next section. The ramp or slope is located leading up to the entrance to the cafe. The width of the ramp or slope is 100cm (3ft 3in). You are on Restaurant Bar Internal (Fitzroy Room). Skip to the next section. The distance between the floor and the lowest table is 72cm (2ft 4in). There is level access if entered from inside the house. You are on Museum. Skip to the next section. Exhibits cannot be audio described. Tactile signage for exhibits is not available. To borrow the wheelchair, ticket office or house staff. You are on Accessible Toilet (Courtyard Toilets). Skip to the next section. This accessible toilet is approximately 25m (27yd 1ft) from the accessible entrance. This accessible toilet is located just off the courtyard, past the cafe. The dimensions of the accessible toilet are 130cm x 245cm (4ft 3in x 8ft). The height of the toilet seat above floor level is 52cm (1ft 8in). The hand dryer is placed higher than 100cm (3ft 3in). The accessible toilet is accessed via a moderate ramp with a small gutter in front of it. There are separate baby changing facilities. You are on Accessible Toilet (Main House Toilets). Skip to the next section. This accessible toilet is approximately 26m (28yd 1ft) from the accessible entrance. This accessible toilet is located past the Fitzroy Room. The dimensions of the accessible toilet are 123cm x 200cm (4ft x 6ft 7in). The lateral transfer space is 65cm (2ft 2in). The height of the toilet seat above floor level is 44cm (1ft 5in). There are baby changing facilities in the accessible toilet. The accessible toilet is also accessed via the moderate ramp, which has a handrail on both sides. You are on Accessible Toilet (Lakeside Cafe Toilets). Skip to the next section. This accessible toilet is located by the Lakeside Cafe and Adventure Playground. The dimensions of the accessible toilet are 190cm x 220cm (6ft 3in x 7ft 3in). The lateral transfer space is 100cm (3ft 3in). The accessible toilet is also accessed via the easy slope. You are on Standard Toilet(s) (Courtyard Toilets). Skip to the next section. The female toilet facilities that were surveyed are located just off the courtyard, past the cafe. The female toilet(s) is/are approximately 26m (28yd 1ft) from the accessible entrance. Inside the venue, there is not level access to the female toilet(s). The male toilet facilities that were surveyed are located just off the courtyard, past the cafe. The male toilet(s) is/are approximately 24m (26yd 9in) from the accessible entrance. Inside the venue, there is not level access to the male toilet(s). You are on Standard Toilet(s) (Main House Toilets). Skip to the next section. The female toilet facilities that were surveyed are located past the Fitzroy Room. The female toilet(s) is/are approximately 32m (34yd 2ft) from the accessible entrance. The male toilet facilities that were surveyed are located past the Fitzroy Room. The male toilet(s) is/are approximately 30m (32yd 2ft) from the accessible entrance. You are on Standard Toilet(s) (Lakeside Cafe Toilets). Skip to the next section. The female toilet facilities that were surveyed are located by the Lakeside Cafe and Adventure Playground. The male toilet facilities that were surveyed are located by the Lakeside Cafe and Adventure Playground. Documents are available in large print. The photo shows the 'Kelly Car'.